To stimulate the operation and development of renewable energy sources in Ukraine, a «green» tariff, or special feed-in tariff as this may be known in other jurisdictions, was introduced in 2009. The feed-in tariff for green projects in Ukraine is one of the highest in the world, which makes investment into this sector very attractive. Green tariffs are established until 1 January 2030. The green tariff amount is defined in each case by multiplying the retail tariff for consumers of the second class of voltage as of January 2009 (UAH 0.5846) by the green tariff coefficient. 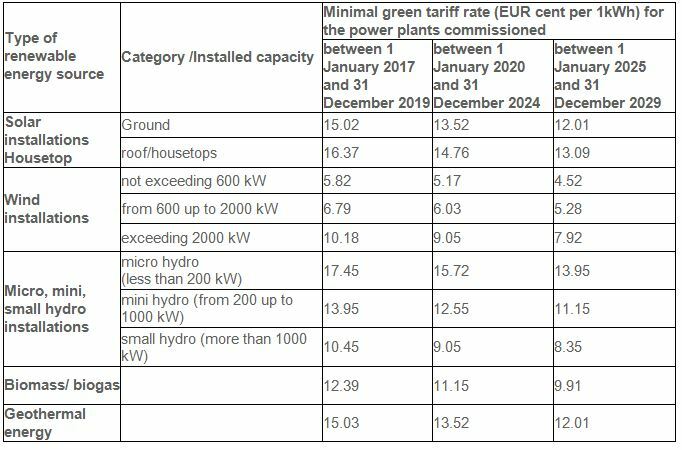 The amount of the green tariff coefficient varies depending on the type of RES, the commission date of the electricity generation unit and the particular characteristics of the unit (i.e., its power capacity). At the same time, the green tariff amount cannot be below a guaranteed «minimum floor» set by the NEURC on a quarterly basis by exchanging the green tariff calculated as of 1 January 2009 (using the average exchange rate of the National Bank of Ukraine for the last 30 days) into euros. However, prior to taking the decision on the green tariff, the NEURC now requires that the RES Producer should arrange for the public discussion of the issues related to the necessity to obtain a green tariff for the respective RES at the local level attracting the local authorities and thereafter the public discussion of the proposed draft NEURC resolution approving/disapproving the green tariff by all interested parties at the NEURC’s level. Taking into account the time frames established for the public discussion of the green tariff issues at the local level (up to 14 calendar days) and then for the public discussion at the NEURC’s level (up to 5 business days) as well as the time required by NEURC to consider and approve the submitted documents, it may take up to one month for the RES Producer to obtain the green tariff (NEURC Resolution No. 866 dated 30 June 2017). The list of equipment for each type of RES that qualifies for the green tariff premium and its specific percentages are prescribed by law, i.e., for blades and towers such indicator is established at the rate of 30%; and at 20% for gondolas and main frames (Law of Ukraine No. 555-IV dated 20 February 2003 «On Alternative Energy Sources»). To stimulate the on-going reforms of the electricity market, in April 2017 Verkhovna Rada of Ukraine adopted the Law of Ukraine «On the Electricity Market» (the “Law”). The Law became effective in June 2017, however the new electricity market segments will become fully operational in Ukraine no earlier than 1 July 2019. The guaranteed purchaser is entitled to compensation for the difference between the price paid to the RES Producers and the price of electricity resold on the day-ahead and intraday markets as payment for its services for the increase of the share of electricity generated from the RES. The amount of such compensation is to be approved by the NEURC. The compensation to the guaranteed purchaser shall be made by the nuclear power plants until 1 July 2020 and, afterwards, by transmission system operator (currently the National JSC «Ukrenergo») until 1 January 2030.